Dubai, UAE, July 08, 2018: Following a successful rollout of the latest LG G7 ThinQ+ smartphone in South Korea, the Americas and Europe, LG has now launched its premium flagship smartphone in the GCC. The LG G7 ThinQ+ marks LG’s first G-series flagship phone with AI capabilities built-in, redefining how ‘smart’ a smartphone can be. The latest smartphone also comes with a host of new features and upgrades. Qualcomm’s fastest Snapdragon 845 mobile platform gives the LG G7 ThinQ+ the computing power for its advanced AI functions, which starts with its innovative AI CAM. 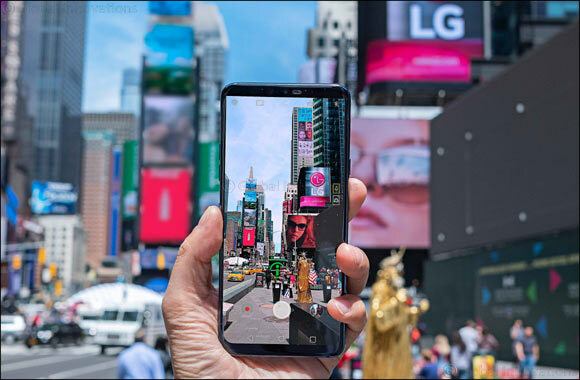 The new LG G7 ThinQ+ comes with a redesigned wide-angle 16MP rear dual camera set-up, and an 8MP front camera, that harness the power of AI for the most impressive images. The AI CAM allows users to automatically optimise shots based on subject matter. In other words, the AI can not only identify different subjects in the frame, but optimise images based on the type of subjects you are trying to capture. Additionally, the Super Bright Camera technology automatically brightens dimly-lit objects by a magnitude of four without additional noise or grain, ensuring you always have the sharpest, clearest images. The LG G7 ThinQ+’s also features LG’s brilliant Super Bright Display technology. With a brightness of 1000nits, the display can render vivid colours even under the brightest lighting conditions. The 6.1-inch QHD+ (3120 x 1440) display with a 19.5:9 FullVision screen ratio is housed in a form factor that is perfectly designed for use with one hand. To help consumers take advantage of helpful voice commands and the AI features of Google Assistant, the LG G7 ThinQ+ offers a dedicated Google Assistant Key that provides quick and easy access to Google Assistant – a first for a smartphone. Faster and less obtrusive in public than saying, “OK Google,” the Google Assistant Key provides a convenient way to get more things done with voice than ever before. LG has also incorporated Super Far Field Voice Recognition (SFFVR) that can recognise voice commands from up to five meters away, making the G7 as effective as a home smart speaker – listening for and responding to requests from across the room – as a smartphone that is close at hand. For audiophiles looking to get the most out of their audio collections, the onboard Hi-Fi Quad DAC, DTS:X and earphone jack make the LG G7 ThinQ+ the perfect choice. The LG G7 ThinQ+ also boasts the Boombox Speaker that generates twice the bass of typical smartphones via its large resonance chamber that amplifies audio when placed on a solid wood or metal surface.